On both a conceptual and empirical level, serious research on cultural differences in organization and management has been simultaneously facilitated and inhibited by the existence of multiple and often conflicting models of national culture. These models offer useful templates for comparing management processes, HRM policies, and business strategies across national borders. Some models have gone a step further and offered measures or numerical indicators for various countries that have been used widely in cross-cultural research. However, a problem that continues to plague organizational researchers in this area is a lack of convergence across these models. This divergence represents what we refer to as the culture theory jungle – a situation in which researchers must choose between competing, if sometimes overlapping, models to further their research goals and then defend such choices against a growing body of critics. This reality fails to facilitate either parsimony or rigor in organizational research, let alone useful comparisons across studies and samples. As such, after a brief review of the divergence that currently exists in the most commonly used models of culture, we argue in this paper that a clear need exists to seek convergence across the various models where it exists in ways that facilitate both research and meaningful cross-cultural comparisons. We then seek such convergence by identifying five relative common themes, or core cultural dimensions, that pervade the various extant models. Based on these themes, culture ratings for country clusters are presented based on data secured through the use of multiple measures and multiple methods. tribes, a Hispanic village, a Mormon village, and a farming village of Anglo-American homesteaders. The five dimensions are identified in table 1.1. Each dimension is represented on a three-point continuum. Dutch management researcher Geert Hofstede (1980, 2001) advanced the most widely used model of cultural differences in the organizations literature. His model was derived from a study of employees from various countries working for major multinational corporation and was based on the assumption that different cultures can be distinguished based on differences in what they value. That is, some cultures place a high value on equality among individuals, while others place a high value on hierarchies or power distances between people. Likewise, some cultures value certainty in everyday life and have difficulty coping with unanticipated events, while others have a greater tolerance for ambiguity and seem to relish change. Taken together, Hofstede argues that it is possible to gain considerable insight into organized behavior across cultures based on these value dimensions. Initially, Hofstede asserted that cultures could be distinguished along four dimensions, but later added a fifth dimension based on his research with Michael Bond (1991). The final five dimensions are illustrated in table 1.2. Edward T. Hall (1981, 1990), a noted American cultural anthropologist, has proposed a model of culture based on his ethnographic research in several societies, notably Germany, France, the US, and Japan. His research focuses primarily on how cultures vary in interpersonal communication, but also includes work on personal space and time. These three cultural dimensions are summarized in table 1.3. Many of the terms used today in the field of cross-cultural management (e.g., monochronic-polychronic) are derived from this work. presented a somewhat different model of culture based on his study of Shell and other managers over a ten-year period. His model is based on the early work of Harvard sociologists Parsons and Shils (1951) and focuses on variations in both values and personal relationships across cultures. It consists of seven dimensions, as shown on table 1.4. The first five dimensions focus on relationships among people, while the last two focus on time management and society’s relationship with nature. represent universal needs of human existence. The human values identified are: power, achievement, hedonism, stimulation, self-direction, universalism, benevolence, tradition, conformity, and security. Schwartz (1994) argued that individual and cultural levels of analysis are conceptually independent. Individual-level dimensions reflect the psychological dynamics that individuals experience when acting on their values in the everyday life, while cultural-level dimensions reflect the solutions that societies find to regulate human actions. At the cultural level of analysis, Schwartz identified three dimensions: conservatism and autonomy, hierarchy versus egalitarianism, and mastery versus harmony, summarized in table 1.5 below. Based on this model, he studied school teachers and college students in fifty-four countries. His model has been applied to basic areas of social behavior, but its application to organizational studies has been limited (Bond, 2001). 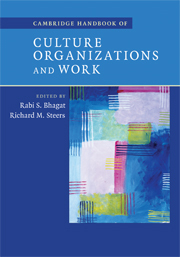 Finally, in one of the most ambitious efforts to study cultural dimensions, Robert House led an international team of researchers that focused primarily on understanding the influence of cultural differences on leadership processes (House, Hanges, Javidan, Dorfman, and Gupta, 2004). Their investigation was called the “GLOBE study” for Global Leadership and Organizational Behavior Effectiveness. In their research, the GLOBE researchers identified nine cultural dimensions, as summarized in table 1.6. While several of these dimensions have been identified previously (e.g., individualism-collectivism, power distance, and uncertainty avoidance), others are unique (e.g., gender egalitarianism and performance orientation). Based on this assessment, the GLOBE researchers collected data in sixty-two countries and compared the results. Systematic differences were found in leader behavior across the cultures. For example, participatory leadership styles that are often accepted in the individualistic west are of questionable effectiveness in the more collectivistic east. Asian managers place a heavy emphasis on paternalistic leadership and group maintenance activities. Charismatic leaders can be found in most cultures, although they may be highly assertive in some cultures and passive in others. A leader who listens carefully to his or her subordinates is more valued in the US than in China. Malaysian leaders are expected to behave in a manner that is humble, dignified, and modest, while American leaders seldom behave in this manner. Indians prefer leaders who are assertive, morally principled, ideological, bold, and proactive. Family and tribal norms support highly autocratic leaders in many Arab countries (House et al., 2004). Clearly, one of the principal contributions of the GLOBE project has been systematically to study not just cultural dimensions but how variations in such dimensions affect leadership behavior and effectiveness. Taken together, these six culture models attempt to accomplish two things: First, each model offers a well-reasoned set of dimensions along which various cultures can be compared. In this regard, they offer a form of intellectual shorthand for cultural analysis, allowing researchers to break down assessments of various cultures into power distance, uncertainty avoidance, and so forth, and thus organize their thoughts and focus attention on what otherwise would be a monumental task. Second, four of the models offer numeric scores for rating various cultures. For example, we can use Hofstede to say that Germany is a 35 while France is a 68 on power distance, suggesting that Germany is more egalitarian than France. Regardless of whether these ratings are highly precise or only generally indicative of these countries, they nonetheless provide one indication of how these countries might vary culturally. As is evident from this review, there are many different ways to represent cultural differences. Unfortunately, the six cultural models available frequently focus on different aspects of societal beliefs, norms, or values and, as such, convergence across the models seems at first glance to be limited. This lack of convergence presents important challenges both for researchers attempting to study cultural influences on management and for managers trying to understand new cultural settings. that the most productive approach is to integrate and adapt the various models based on their utility for better understanding business and management in cross-cultural settings. In doing so, we seek common themes that collectively represent the principal differences between cultures. While no single model can cover all aspects of a culture, we believe it is possible to tease out the principal cultural characteristics through such a comparative analysis. 1. Distribution of power and authority in society. How are power and authority distributed in a society? Is this distribution based on concepts of hierarchy or egalitarianism? What are societal beliefs concerning equality or privilege? 2. Centrality of individuals or groups as the basis of social relationships. What is the fundamental building block of a society: individuals or groups? How does a society organize for collective action? 3. People’s relationship with their environment. On a societal level, how do people view the world around them and their relationship with the natural and social environment? Is their goal to control the environment and events around them or to live in harmony with these external realities? 4. Use of time. How do people in a society organize and manage their time to carry out their work and non-work activities? Do people approach work in a linear or a nonlinear fashion? 5. Mechanisms of personal and social control. How do societies try to insure predictability in the behavior of their members? Do they work to control people through uniformly applied rules, policies, laws, and social norms or rely more on personal ties or unique circumstances? To achieve this clustering, we must recognize that in a few cases multiple dimensions in the original models can be merged into a single more general or unifying cultural dimension (e.g., institutional and in-group collectivism in the GLOBE model), as discussed below. In addition, we need to look beyond the simple adjectives often used by the various researchers and seek deeper meaning in the various concepts themselves, also as discussed below. At first glance, these five themes seem to replicate Hofstede’s five dimensions, but closer analysis suggests that the other models serve to amplify, clarify, and, in some cases, reposition dimensions so they are more relevant for the contemporary workplace. Indeed, we believe that the commonality across these models reinforces their utility (and possible validity) as critical evaluative components in better understanding global management and the world of international business. As such, each model thus adds something of value to this endeavor. from our comparison, identifying similarities and differences where they exist and teasing out the details. We refer to these themes as core cultural dimensions (CCDs) to reflect both their centrality and commonality in cross-cultural organizational research (see table 1.8). However, it should be emphasized that credit for the identification of these dimensions goes to previous researchers; our focus here is simply to identify a means of integrating, interpreting, and building upon their signal contributions.